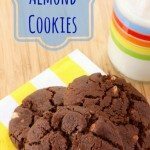 Rich and chocolaty with crunchy almonds, but no flour (making them naturally gluten free), whether you need are looking for an after school snack or planning your Christmas cookie platter, you have to whip up a batch of these easy Flourless Chocolate Almond Cookies. I know in my time here contributing to The NY Melrose Family, I’ve been focused on healthy snacks. But sometimes you just need a cookie. And let me tell you, lately I’ve been wanting to reach for cookies more times than I care to admit, whether for my own stress snacking or as a quick and easy snack for my kids. You see, the movers show up in less than a week to pack up our house and move us to a whole new state – the first time I’m moving out of a twelve mile radius in my entire life. To say that I’m a bit on edge is an understatement. When I am racing around dealing with appointments and contractors and inspections and realtors, and my boys are clamoring for snacks, it’s tempting to reach for convenience foods. And let’s be real – they’re kids. They want (and deserve) a little sweet treat sometimes. So I try to bake up some healthier goodies and keep them on hand in the freezer for those times when nothing will do but dessert. But at least when I’m making them myself, I know exactly what’s in there – no funky ingredients and I can control how much sugar is in them. One of the recent favorites in my house has been Monster Trail Mix Cookies, which are also flourless, whole grain, and can be made gluten free by using certified oats. My four year old has been loving the peanut butter goodness and slight hint of chocolate in those. For anyone with nut allergies, you might prefer some Soft & Chewy Pumpkin Maple Graham Crackers, made with whole wheat flour and sweetened only with a little maple syrup. The little guy has been a fan of these since at nineteen months he still doesn’t have a whole lot of teeth, making these easy for him to gum down. 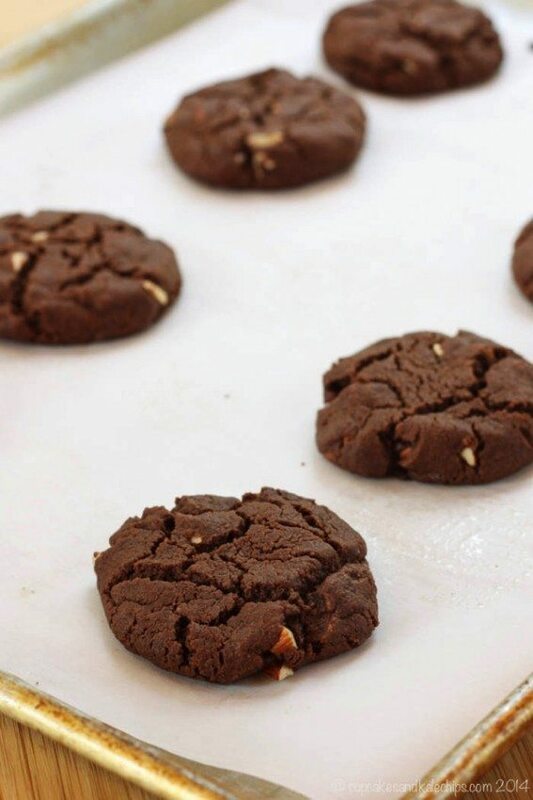 It really couldn’t be easier to whip up a batch of Flourless Chocolate Almond Cookies. The almond butter packs a ton of protein and healthy fats, and cocoa powder has antioxidants but not a ton of calories, am I right? These definitely don’t have a ton of sugar. Plus there’s no flour or butter, making them completely gluten free and dairy free. Enjoy them with a glass of regular or dairy free milk and you have a sweet treat that pretty much has your food groups covered. Well, maybe if you have them with a few apple slices! 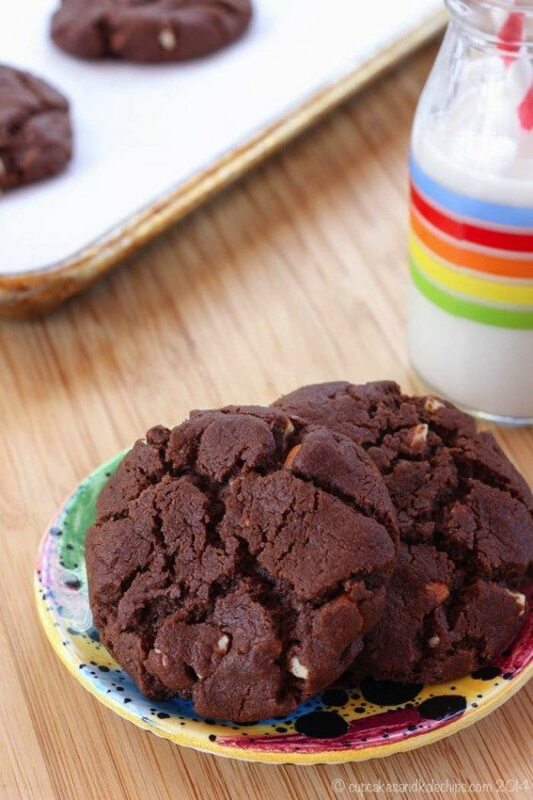 And when the weather warms up, sandwich these cookies with some coconut sorbet for a dairy free special summertime treat reminiscent of an Almond Joy candy bar. So good! 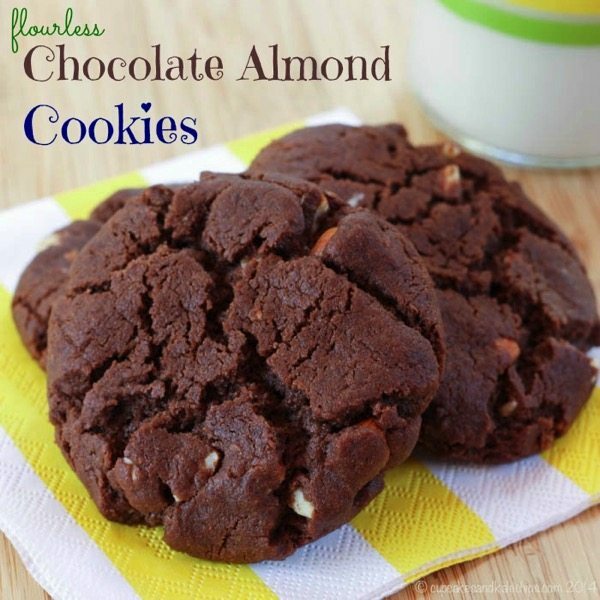 Flourless Chocolate Almond Cookies that are naturally gluten free. Preheat your oven to 350°F. Line two large baking sheets with silicon baking mats or parchment. Add the almond butter, brown sugar, baking soda, cocoa powder, and vanilla, and mix until thoroughly combined. Form balls with about 2 tablespoons of dough, place about six or seven on each baking sheet, a couple of inches apart, and press down to form thick disks. Bake for 10-12 minutes, or until set but still slightly soft to the touch. Cool the cookies on the baking sheet for about 10 minutes, then transfer to a wire rack to cool completely.